Weight loss is one of the most common fitness goals among regular gym goers as well as dieters. It also happens to be the most common fitness goal that ends in failure with studies showing that as much as two thirds of weight loss dieters end up heavier than when they started out while a staggering 95% of weight loss plans fail. Getting rid of unwanted body fat is a long and tough process that is usually riddled with setbacks. The main thing that separates the successful weight losers from the unsuccessful ones is how one responds to setbacks. So, before you think of throwing in the towel, consider these measures on how to how to deal with weight loss setbacks. When you hit a weight loss setback, the very first thing you should do is try to get to the bottom of what is causing your progress to grind to a halt. Take a hard look at your diet and workout plan as well as your calorie-tracking system to ensure everything is on the right track. Knowing what is causing the setback will make you better equipped at avoiding it in the future. Are you sleeping fewer hours than usual? Are you eating more outside than at home? Perhaps you have been eating significantly less than you normally do. Make sure to be very thorough when examining your weight loss plan as even the smallest of indulgences such as taking little tastes while preparing dinner or stealing a couple of fries from a friend’s plate can trigger a setback in your gains. 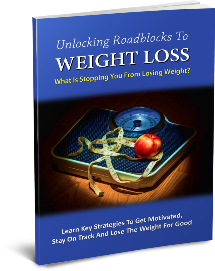 One of the main causes of a setback with weight loss is being stuck in a rut. Doing the same exercise over and over will see your body adapt to the routine and eventually stop responding to workouts. To get out of such a situation, you will need to switch up your workouts. Increase the intensity of your workouts, introduce new and fun routines to your workouts, or do more of weight lifting and strengthening exercises. Any change is good as it will challenge your body anew and therefore prompt it to continue losing fat. Sometimes, weight loss setbacks can be caused by an accumulation of water weight within the body. Excess water retention will leave you feeling puffy, bloated, and heavier making it seem like your weight loss endeavors are having no effect. The good news is that it is quite easy to get rid of excess water weight. Simply drink more water. As long as the body is getting enough water, it will not resort to holding onto every drop of water you consume. Instead of giving up when the going gets tough, simply start moving more. The best way to keep weight loss continuous and consistent is to burn more calories than you consume. So, find simple ways of moving more. Increase the frequency of your workouts, walk more whenever you can, take the stairs instead of the elevator, park your car further from the office, engage in simple exercises while watching TV, and so on. The more you move, the more calories you will burn, and the leaner you will become. What’s more, physical activity boosts mood and can therefore act as a great motivation booster. Whether caused by something you did (e.g. overeating) or something completely out of your control (e.g. injury or sickness), setbacks are almost always a guarantee with weight loss. How you deal with the setback will determine whether you will be successful in reaching your weight loss goal. These tips will help you keep pushing forward when you feel like giving up.